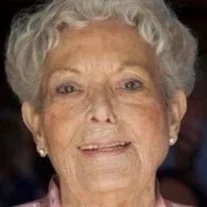 Sibyl Lee Phillips Nance, 92, passed away peacefully at her home on February 4, 2019. She was born Sept. 30, 1926 in Reliance to Maggie (Murr) and Pryor (Papa) Phillips. She married her high school sweetheart and best friend, Robert William Nance, in 1942. Together, they worked at Nance's Dairy, where Robert delivered fresh milk and Sibyl worked in the local ice cream store, as they began a family - their legacy. Sibyl went on to become Roberts #1 drag racing fan, where she cheered him on to become the winner of the Winter Nationals in Daytona Beach, Fl. Sibyl even had a daring side herself as she too took seat in the Plymouth Race Cars. Sibyl became very busy raising their five children and began working at Loveman's while Robert continued his business endeavors. The Nance home held many gatherings and parties at the pool, where many youngsters were taught to swim. Robert proceeded her in death Jan. 4, 1992. Sibyl was a dedicated mother first and foremost. She treasured her children and embraced every moment with them. She especially loved becoming a MeeMaw, and MeeMaw she was to everyone. Sibyl loved all people, cats, the beach, fashion, cooking and hosting parties for her family and friends. She had a BIG personality and never met a stranger anywhere she went. If you knew her, it was hard not to love her. Sibyl is survived by her children, Tena Swanson, Susan Jackson (Tom), Robin Allen, Bobby Nance (Kim), Pryor Nance (Melissa) and Carol Mingle (Mike); 10 grandchildren, Chad Swanson (Angie), Lorie Eaker (Tim), Lisa Forgey Raby (Ronnie), Rob Forgey (Lindsay), Sibyl Rowland (Levi), Matthew Allen (Kristy), Josh Nance (Jessi), Kurt Vandergriff (Jennifer), Ryan Vandergriff (Lexi) and Savannah Nance; as well as 21 great-grandchildren, Maggie and Bo Swanson, Landon, Abigail, Jilliann and Bently Eaker, Austin, Brayden and Nataleigh Raby, Will and Colt Forgey, Allrick and Windsor Rowland, Grafton, Morgan and Grayson Allen, Henry and Finn Nance, Nicholas and Kayleigh Vandergriff and Jaxon Nance; nephews, Frank Lawrence (Barbara) and Mickey Lawrence (Donna); and several great-nieces and great-nephews. Thank you to the nurses and medical staff who helped care for her over the years and a BIG HUG to her children who loved and cared for her daily and whom she loved unconditionally. Family visitation will be on Sunday, Feb. 10 from 4-8 p.m. and a celebration of her life on Monday, Feb. 11 at Ringgold First Baptist Church, where she will lie in state from 2 p.m. until the funeral service begins at 3 p.m. Interment service will follow at Anderson Cemetery. Pallbearers: Bo Swanson, Landon Eaker, Austin Raby, Brayden Raby, Will Forgey, Colt Forgey, Grafton Allen, Jaxon Nance and Henry Nance. Arrangements are by Wilson Funeral Home Wallis-Stewart Chapel Ringgold.